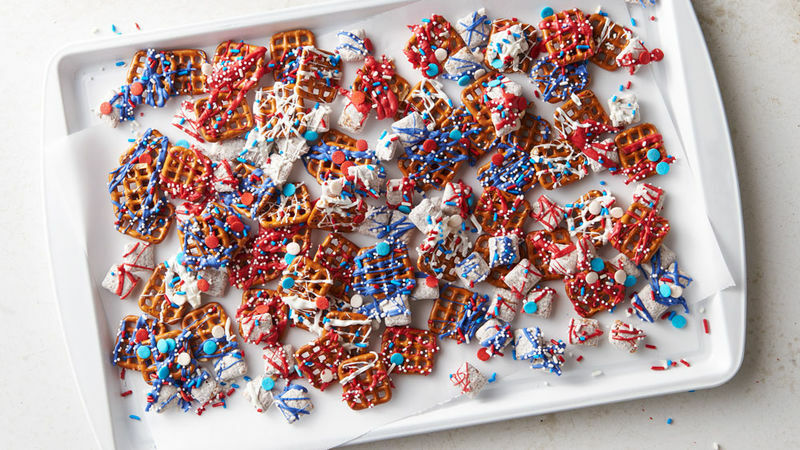 Spread Muddy Buddies™ and pretzels on a large parchment-lined baking sheet. Place candy melts separate microwave-safe baking dishes. Microwave each on High in 30-second bursts until candy becomes soft and melted. With a spoon, gently stir each color to soften, then drizzle over a small portion of the pretzel mixture. Sprinkle with candies, nonpareils and jimmies before drizzling the next section of color. Repeat with other colors of candy melts and more sprinkles. Once the candy melts have set, gently break up the mixture into bite-sized chunks. Serve immediately, or store in covered container until serving time.